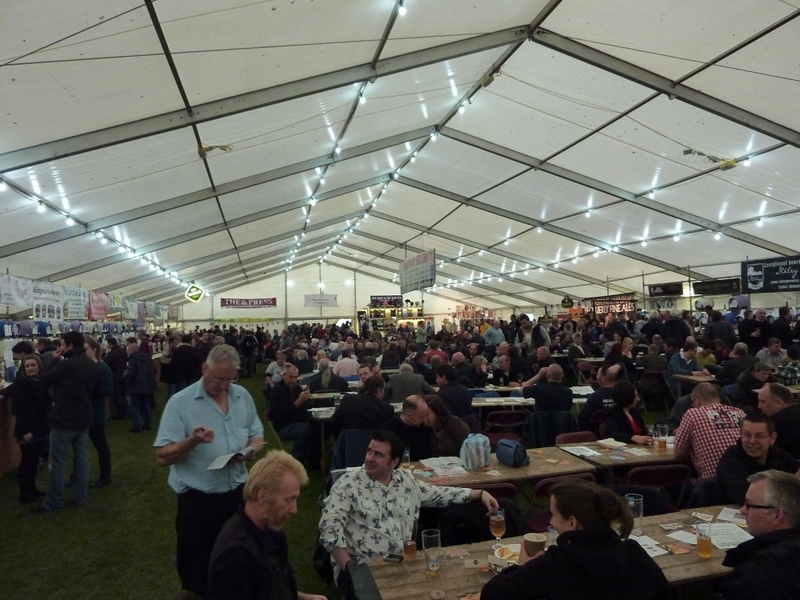 The third York Beer & Cider Festival was held at Knavesmire, near the famous racecourse, from the 15th to the 17th September 2011. I visited on Friday 16th, getting to the huge marquee for about 4 o’clock in the afternoon. I had no problem parking on Knavesmire Road, no more than a few yards from the Festival tent. As card-carrying CAMRA members, Lady A and I got in for a mere £2 each. On top of that, the programme cost 50p, and a £1 refundable deposit had to be paid for the polycarbonate glasses (the licence for the venue prohibits actual glass). Lady A and I, however, plumped for the attractive goblet shaped polycarbonates, which required us parting with £3 each. These receptacles were not returnable and the £3 non-refundable. I don’t know why. From the start, I was impressed by the organization. Seating was provided throughout the two marquees at long wooden tables with fold up chairs. A beer festival with no seating can be a tiring affair. 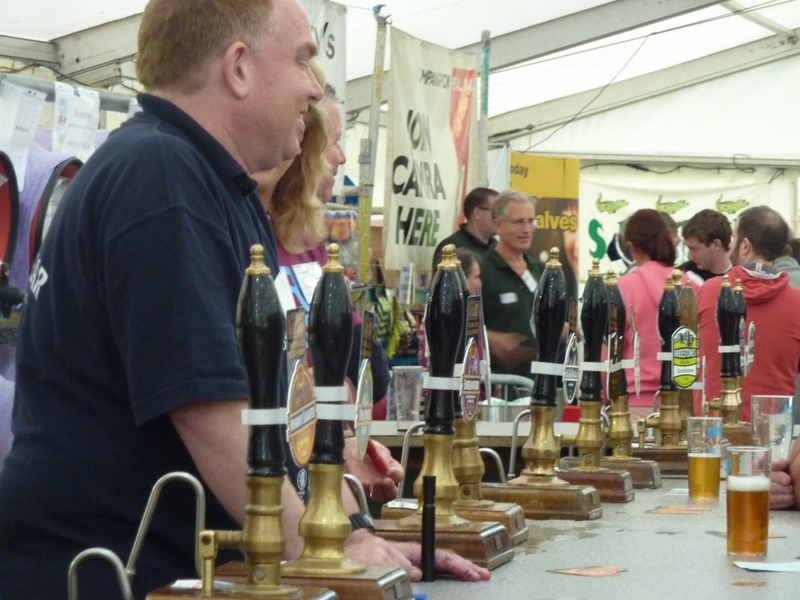 This was clearly not just a beer festival, but a festival of all things beery. There was a tee-shirt stand, a book stand, Fentiman’s soft drinks stand, a stand selling pewter tankards, a specialist coffee stand. Food was not neglected either. 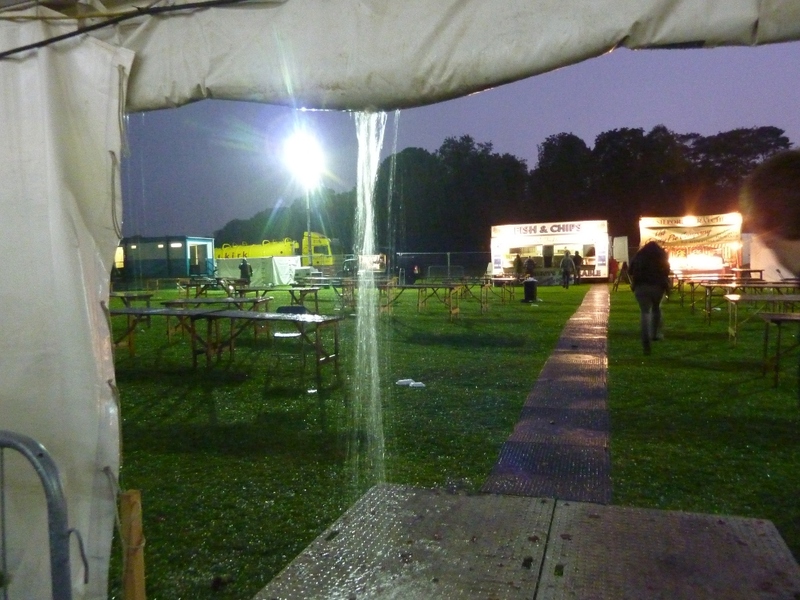 Outside the main marquee were mobile foodshops – Pies, pasties, fish & chips, a hog roast, German sausages & bratwurst, burgers, baked potatoes and vegetarian curries were all available. I had a superb steak and ale pie with chips. Over 250 beers were on offer, 6 breweries had their own bars here, offering in total 40 ales – a small beer festival in itself! Then there was the LocAle bar, with offerings from 22 further breweries located within 25 miles of York. The ‘Rest of the UK’ section included beers from a further 50 breweries from as far away as London (Fullers) and Brighton (Dark Star). The choice was immense. This was also a great opportunity to sample beers from some of the newest breweries on the block. Barkston, Black Paw, Brass Castle, Brightside, Cleveland, Geeves, Haworth Steam, James & Kirkman, Kirkstall, Magic Rock, Milltown, North Riding, Owenshaw Mill, Rough Draft, Scottish Borders, Sherfield Village, Slightly Foxed, Sportsman, Two Roses, Tyne Bank, Walls and Welbeck Abbey – 22 breweries that only began brewing in 2011 were represented here. 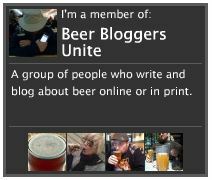 What clearer sign could there be of the health of the British Real Ale scene than that? How many of them continue to thrive over the next few years is open to debate, but let’s wish all of them all the best! There being such a choice, I had to rationalize my drinking policy. I decided to sample only beers from breweries that were new to me, and only to drink dark ales. I had been to another, smaller beer festival in Horwich, near Bolton, the previous weekend, where there was a dearth of dark ales, so I sought to redress the balance. There was one exception to this rule – Fuller’s Vintage Ale, which is an exceptional ale in many ways. My first was Bridestones Dark Mild, a nice gentle introduction to the session. It’s very dark red and has a respectable ABV of 4.5%. The smell is sweet and slightly caramel. The taste is also sweet and malty, Lady A tasted toffee in there too, though I couldn’t place it. Cropton Blackout, a very dark brown porter, apparently made to a ‘unique’ 1930s recipe, weighs in at 5.0%. The smell presents hints of smoke and frankfurters. The taste is like smooth, silky liquid chocolate with hints of fruit and tiny touches of the smoke and frankfurters experienced in the smell. The mouthfeel is incredible. This is a sensational ale. My next choice was the wonderfully named Bird Brain Chocolate Penguin, but unfortunately it had just sold out. The volunteer barman suggested I try Brass Castle Bad Kitty instead, promising very generously that if I didn’t like it, he’d drink it for me. Comforted by such an ironclad guarantee, I agreed. Bad Kitty is quite black in colour and has a fantastic chocolate aroma. The taste is of chocolate and smooth vanilla, wrapped up in a silky smooth mouthfeel. Absolutely wonderful. It reminded me very much of one of my current favourite ales – Titanic Chocolate and Vanilla Stout, which manages to be fabulous out of the cask and the bottle. The next beer on my list was Fernandes Malt Shovel Mild, a very dark red in colour but lighter than previous samples at 3.8%. Again, I found chocolate to be dominant in the aroma. The beer is full-bodied, chocolatey and malty, and yet the finish was thinnish. A slightly disappointing end to an otherwise very fine mild. A contrast was provided by Kirkstall Black Band Porter, a deep brown 7.6% ale. The smell was very strong and malty, with the taste being much the same. The malt flavour in this beer is one of the strongest I had experienced recently. A dark and bitter ale. I reckoned by now the time was right for an Imperial Russian Stout, and I opted for Revolutions Propaganda, not the strongest of Imps at 7.8%, but with enough of a kick. This beer was being launched at the festival, so here was a brand new Imp for me to try. The smell is malty, as expected. The taste starts smoothly with a slightly thick mouthfeel, initially malty but with that characteristic spirituous overtaste kicking in near the middle of the taste. The overall effect is of smooth liquorice with a bitter finish. A great example of an Imp! I’ll be looking out for this one. At this point, the heavens really opened. As you can imagine, the noise in the marquee was quite high as everyone got into their sessions, but it was all drowned out by the hammering of the rain on the marquee roof. There had been ominous rumblings before, but now the lightning was flashing regularly. A few moments later, inevitably, perhaps, the lights went out. There was a great cheer, and the emergency lights kicked in almost immediately. The lights went on and off for about an hour as electricians battled bravely with the generators – disturbed by a nearby lightning strike. With the emergency lights on, however, it never got so dark that I couldn’t read my programme. More importantly, perhaps, the dimmer conditions in no way affected the flow of beer, and my next sample was Ridgeside Black Night, a lovely dark ale with an ABV of 5%. Sweet smell, the taste was of sweet malt and, oddly, vegetables. The taste is interesting and good, very fresh tasting. M’lady commented that it tasted as though it should be doing us good. Cleveland Black Stuff, very dark brown with a 4.5% ABV was the next to fill my glass. Described in the tasting notes as a ‘dark mysterious ale with a velvety chocolate aftertaste’, I though the wrong beer had been poured into my glass. It smelled very strongly of frankfurters, and the taste was similar, but thin and a bit watery. Sorry, Cleveland, the notes and the taste don’t match. 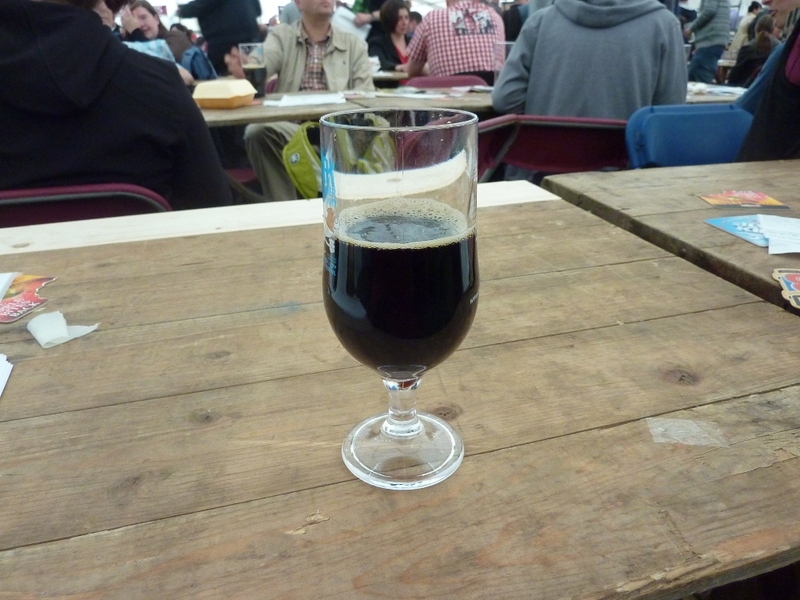 Sherfield Village Pioneer Stout provided my last tasting for the festival. Black coloured and weighing in at 5%, Pioneer is very rich. Dark malty liquorice and treacle dominate a very smooth, full-bodied flavour. A lovely, lip-smacking finish. This beer festival was so well-organized and had such an excellent choice of beers (not to mention 30 ciders and perries and a foreign beers bar) and merchandise that I could happily have come here on all three days. As I have found to be normal, the atmosphere was friendly and convivial. I did see one man being escorted out, snarling and snapping, but there was a good presence of stewards, making the ejection as painless as possible for everyone else. 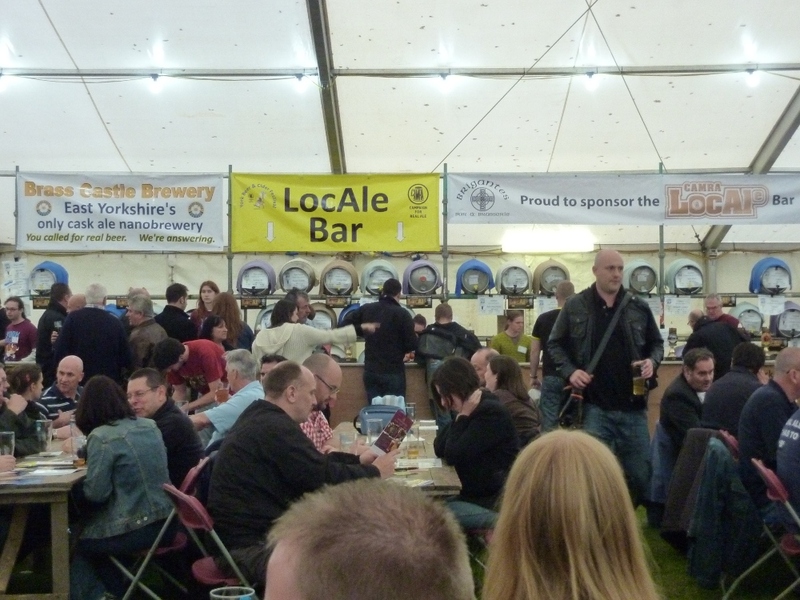 I have been to many beer festivals, and I love them all, but for all the effort that obviously went into this one, congratulations York CAMRA – your beer festival was the best. 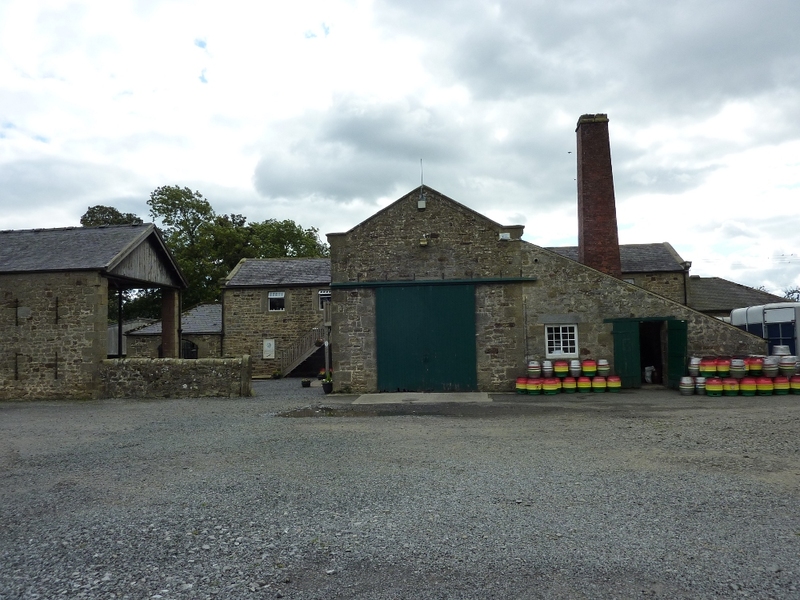 High House Farm brewery is in Northumberland, located a couple of miles south-east of Matfen, thirteen crow-flight miles from Newcastle-upon-Tyne. It’s a small affair, part of a larger concern that includes a working farm, visitor centre, brewery shop and a small bar. As I was passing, I decided to drop in and have a look for myself. 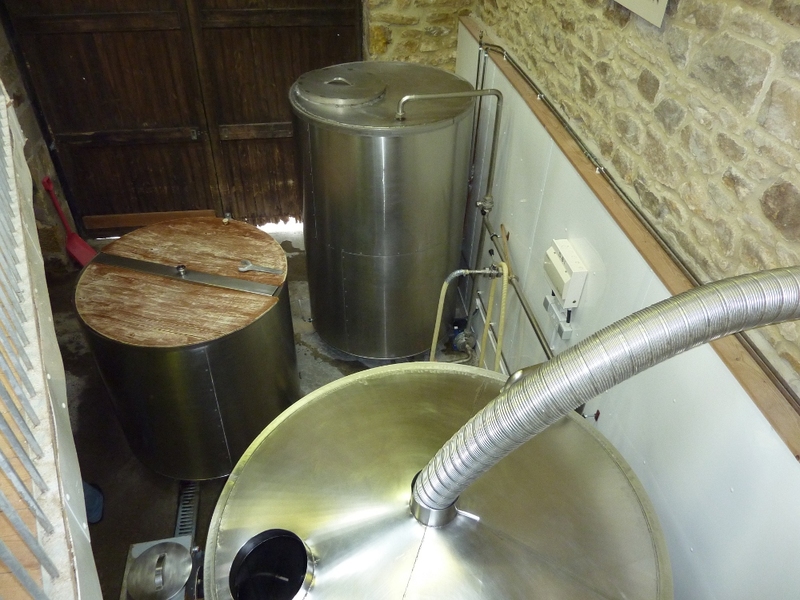 The brewery is very compact, and can be viewed from above from the bar, or alternatively, with 24 hours notice, you can book a 30 minute brewery tour. I hadn’t booked, so contented myself with the birds-eye view. The brewery shop and bar are located on the first floor, above the actual brewery. The bar is small and cosy, with a good selection of the native brews on offer. Unfortunately, as I was driving, I couldn’t sample any, so instead I settled for a quartet of bottled High House beers from the brewery shop. A few evenings later, I settled myself in my favourite armchair and gave my attention to the four bottles I had bought. The first was Auld Hemp. This is a 3.8% bitter, orangey-brown in colour, though the beer was not bottle conditioned. The taste is malty and nutty, with a tiny hint of caramel. The taste leads smoothly into a gentle, bitter finish. If this beer was on the bar, I would be more than happy to have a session on it. Next up was Nel’s Best, made with Goldings hops. Orange in colour, this has an ABV of 4.2% and is described on the bottle as a ‘premium ale’. The taste is nicely balanced and full flavoured with a good, bitter, hoppy finish. I’m not sure what High House’s definition of a ‘premium ale’ is, I would have called this a best bitter, and it’s a good one. This beer was a finalist in the UK Champion Beer of Britain Awards in both 2003 and 2006. It was the winner of Best Bitter in the North (a SIBA award) in 2008. The third offering from High House Farm was Matfen Magic, slightly stronger than the previous two at 4.8%. This is again described as a ‘premium ale’ on the bottle, but it’s clearly a brown ale. The colour is a dark browny orange, again slightly hazy. The flavour is smooth and rich. There is a blackberry fruitiness with an underlying chocolate smoothness. The ending is hoppy and bitter with a slight zing to it. It’s absolutely lovely, and I wasn’t at all surprised to find that this is High House’s best-selling beer. These three are High House’s regular brews, but along with many other breweries, they also produce several seasonal, occasional and special brews. My fourth bottle was one of these, Matfen Spire. 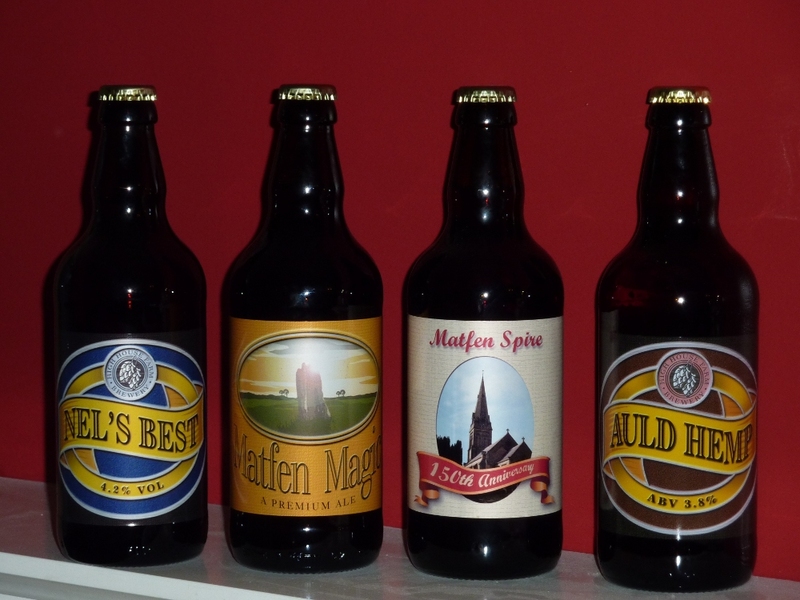 Matfen Spire was brewed to celebrate the 150th anniversary of the building of the spire on top of Matfen parish church. It’s a 4.8% light red coloured bitter made with Fuggles and Brambling Cross hops. The flavour has distinct tones of autumnal berries followed by a hoppy bitterness. There are warming malty overtones throughout the taste. This beer is not listed on the brewery’s website, so it may have been a short-term brew. Maybe it will reappear one day under a different name to celebrate another anniversary. Currently, High House Farm ales are mostly sold fairly locally, though according to the 2012 Good Beer Guide, over 350 outlets are supplied. I have found a couple of their beers in Lancashire this year, Auld Hemp at a festival, and Lily Brewster in a pub. Hopefully the trend will continue. These beers are worth seeking out.